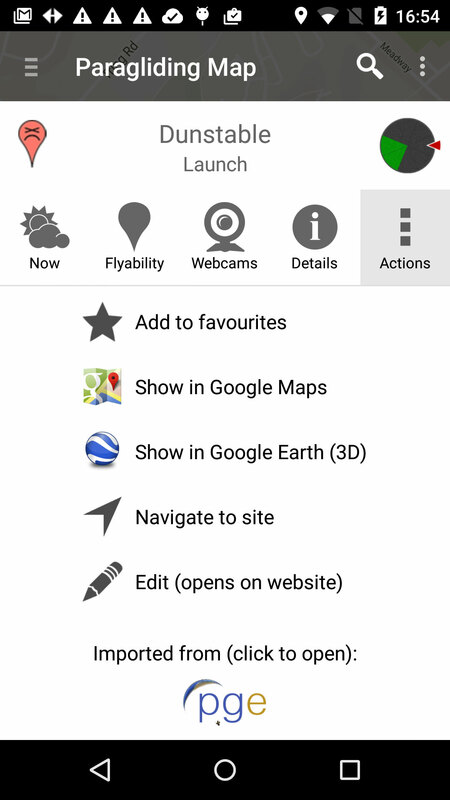 You can experience all the information of Paragliding Map in the palm of your hand using Android! The app has recently been updated to use the new Google Maps and Material Design included in Android Lollipop, but is also backwards compatible. Paragliding Map for Android has some cool features that use the special sensors and features of mobile devices such as location features and GPS navigation. 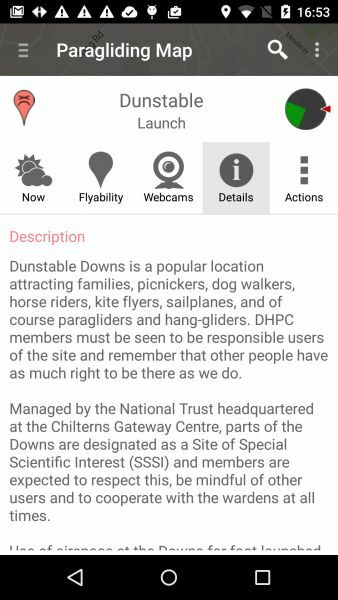 Check out a selection of other features available in the app. GPS navigation* Once you find a site you want to fly, you can use Google Maps navigation to drive to the takeoff or landing. My location Show your location on the map as a blue icon in real time. This feature is useful if you're walking a forest trail to a takeoff and need to ensure you are walking in the correct direction! Partial site name. Eg: "inter" will find "Interlaken", but also "Mürren" because it is close to Interlaken. Region. Eg: "alsace" will return all sites in the Alsace region of France. Intelligent special characters. Eg: "murren" will automatically find Mürren. 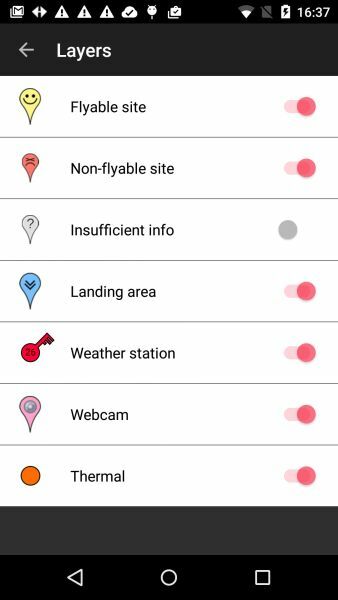 Advanced search allows many extra criteria to be specified, such as "search within X kilometers", wind direction(s), thermal / soaring / towing, etc. 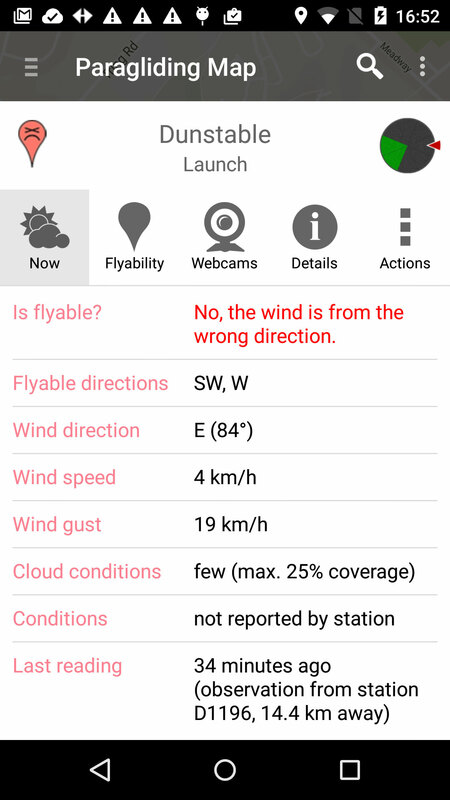 Site details The usual site details are displayed, such as acceptable wind direction, current wind direction, gust strength, cloud condition, etc. 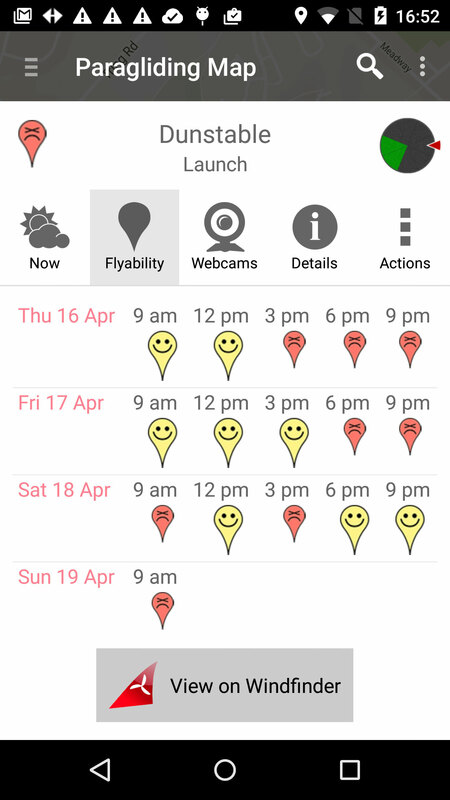 3-day "flyability forecast" The 3-day flyability forecast is displayed as "happy" and "sad" icons just like on the website, so it's easy to see at a glance when it is likely to be flyable. 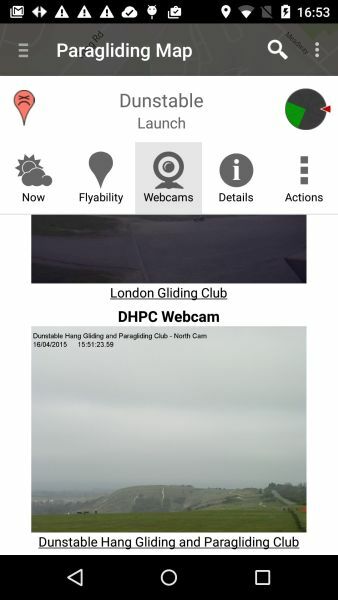 Webcams* Where available, up to 3 webcams are displayed for each site. This is especially useful to check actual conditions match the reported conditions. Sometimes, you can even check if other pilots are already in the air! 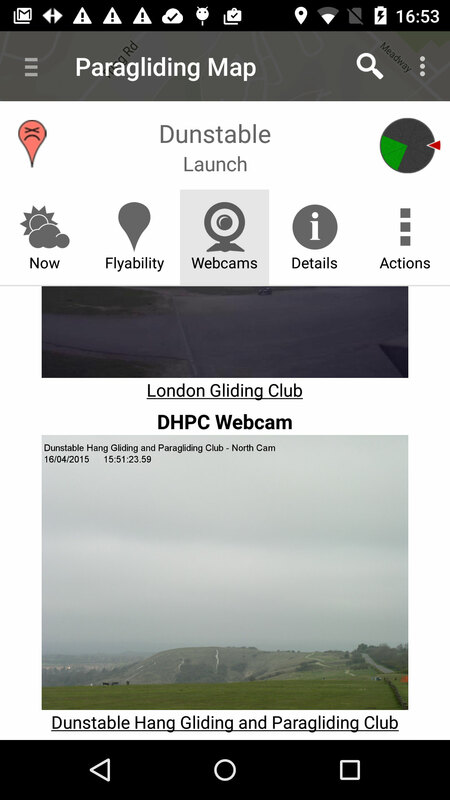 Additional webcams which are not automatically linked to sites are also displayed on the map, which allows you to pick and choose webcams which weren't automatically linked to a site because they are too far away. * Features marked with asterisks require in-app purchase. 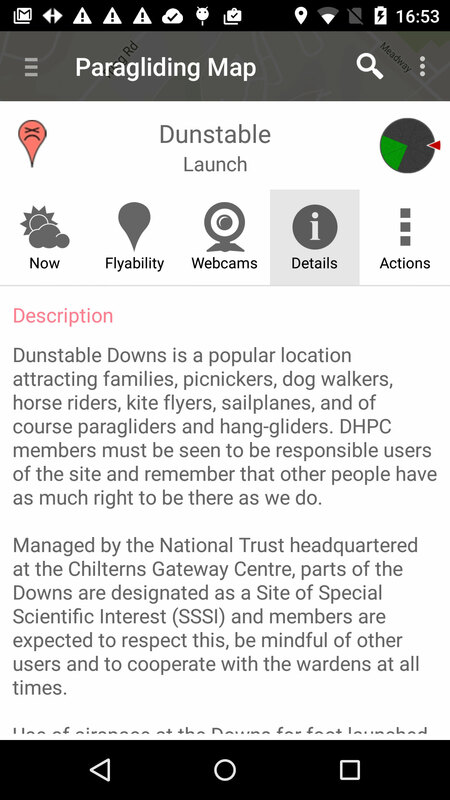 Paragliding Map was previously offered as 2 different apps, FREE and PRO. Now there is a single app which unlocks PRO features via an in-app purchase. Your PRO purchase should have been transferred to the new app as "PRO version 2012", which enables all the features you purchased in the PRO version. In addition, you can use the upgraded version of these features, and of course, all the bugfixes for free. The new Android version took 4 months of full-time work, which unfortunately means I have to charge for the new features (advanced search, view in 3D, favourites, send my location). But because you already purchased the PRO version, I wanted to make sure you didn't have to pay the full price. If you want the new features, "PRO version 2015 (upgrade)" should be available to you, which costs only half the full price. Please feel free to contact me if you have a problem. Paragliding Map is fully supported! Download Paragliding Map for Android from the Google Play Store to enjoy using Paragliding Map in the palm of your hand!